2-, 3- and 4- bladed manganese bronze propellers, statically and dynamically balanced. Diameter in pitch in inches. 2-, 3-and 4- bladed manganese bronze propellers, statically and dynamically balanced. 1:10 tapered (except propellers Ø19, 3º 30'). Diameter and pitch in inches. 4 - blades manganese bronze propellers, statically and dynamically balanced, 1:10 tapered (except propellers Ø19,3º30'). Diameter and pitch in inches. ... profile for a minimum drag in closed position. Geared blades for simultaneous closure. 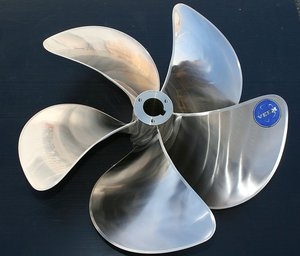 We do not manufacture folding propellers for saildrives. Normal open propeller for Each boat & situation we wil offer you a suitable propeller design with our inhouse engineering. Propeller Hardware Kit, Propeller Lock, Bushings, and 4-Stroke Propellers. The choice of which propeller is suitable for you depends on speed, draught and your sailing profile. Veth Propulsion offers a suitbale solution for every situation. The propeller is a cast element consisting of a set of blades around a central hub and designed to transform an engine's rotary motion into propulsion. It usually has two to seven blades and a diameter ranging from a few centimeters to several meters on large ships. All vessel propulsion systems other than hydrojets are equipped with a propeller. This includes drive shaft, pod and other configurations. There are propellers for every type of motor, from the tiniest outboard to those powering supertankers. The rotating propeller creates a pressure differential between the forward and aft faces of the blades, sucking water toward itself and pushing it astern, driving the vessel by hydrodynamic thrust. Its primary characteristics are the diameter, the number of blades and their pitch, rake (angle fore or aft with respect to the hub) and cup, or tip curvature. Some models have folding blades to reduce drag on sailboats. On variable-pitch versions, blade angle of attack changes with boat speed to optimize torque, increasing efficiency and reducing fuel consumption. Certain twin-screw vessels with powerful engines have propellers which rotate in opposite directions. Choice of propeller will depend on motor type, power, rotational speed and gearing type and ratio. The central axis can be machined as a conical cavity for propeller shafts and outboards or as a crenelated cavity for pods and similar drives. Power transmission type and dimensions are the determining factors.